Seriously. Heads need to roll and people.need to be sent packing fast in Honda's race development. My god poor Alonso. I can just imagine his words to them.. He was the star of today's race. While it is certainly not the result he expected, it's evident the crowd loved him. I hope he comes back. Incredibly fortunate for Dixon his car landed the way it did. Could easily have been like Dan Weldon or Greg Moore's fatal crashes with massive head trauma when the car's top side hit track structures. Wild ride for Dixon, shame for Alonso. Can't believe Dixon is currently running P6 in today's race on Belle Isle after the massive wreck at Indy last week.... amazing. The ultimate bridesmaid of CART/Indy, Hélio Castroneves has never won a championship but 2nd four times and 3rd places four times. Didn't know that til I read the article. I remember watching him in Indy Lights way back in the day. Only Scott Dixon, Helio Castro-Neves, and Tony Kanaan are left from the golden age. Speaking of bridesmaids, quite a few Indy drivers came to Marco Andretti's wedding. Quite a beautiful bride of Marco's as well. Jesus, I don't remember seeing her at the Glen!! Portland replaces the Glen for Labor Day weekend. Haven't spoken with my brother yet about it but it is unfortunate given how he stepped up to the plate to rescue a race weekend that got scrapped in Boston by Indycar by offering the Glen. Too bad. Looks like IndyCar is going back to Portland. 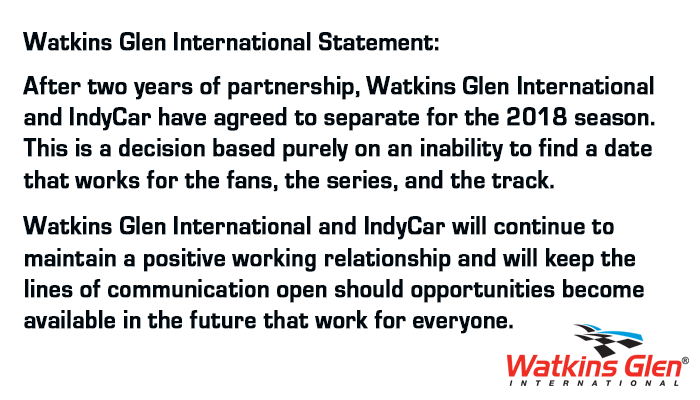 Sorry to read that, hope the Glen and IndyCar can somehow work out arrangements for future dates. 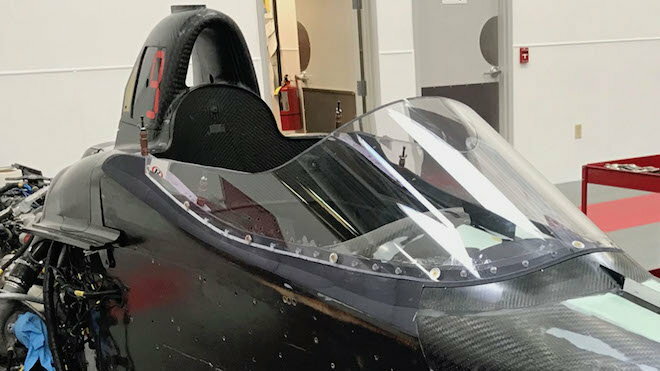 IndyCar's prototype windshield. Not the best, but compared to the alternative Halo, this is awesome. I hope it's a success and forces F1 to change. ^ Looks OK for what they're trying to do. Lucky for Bordais, but I also like him as well. Talented and hard working driver. Nice article about him, his family and St. Pete community. Was rooting for Rossi to be able to pull off the pass but it didn't work out. Pretty amazing three car pass by Bourdais at the tight Long Beach race. Great move. Especially at Long Beach. Talk of McLaren going full time in IndyCar is gathering steam. Representatives from the McLaren Racing team will visit the Verizon IndyCar Series paddock during this weekend’s Dual In Detroit. Meetings will be held with prospective partner teams at Belle Isle as the Formula 1 outfit explores options to field a full-time IndyCar entry as early as 2019. “Gil [de Ferran] and I and a few more McLaren people will be in Detroit [for] meetings,” McLaren CEO Zak Brown confirmed to RACER. I think it would be great to see McLaren and Alonso full time in IndyCar next year, but considering how bad things are at McLaren, Zak Brown should really focus on righting the ship first. Oh crap! That's terrible news. McLaren has reportedly scrapped its plans to enter an Indycar team for 2019. The move was being planned by Zak Brown, but a performance and management crisis within the Woking based team means the Indy dream is the victim. Auto Motor und Sport reports that the plan is "on hold" on the instruction of team financiers Mansour Ojjeh and the Bahrain royal family. However, Brown said it is still possible that Fernando Alonso will push to complete his 'triple crown' next year at the Indy 500. "As for what Fernando does next year, there are several options," he said. "He really wants to win the triple crown and we would like to do it with him. For now we are not discussing next year but everything is possible." Some believe that with Andrea Stella and Gil de Ferran now taking prominent roles at McLaren, Alonso is essentially orchestrating things at McLaren. Brown even said this week that Alonso was part of the decision to oust Eric Boullier. "I was not consulted, I was informed," Alonso said at Silverstone. "Stoffel was also informed. Of course, Zak wanted to know my opinion of Andrea and Gil, but I fully respect any of their decisions." However, team executive Brown admits that McLaren could still be "years" away from winning. "I don't know if it will be two, ten (years) or something in between, but realistically, it will take a while to solve it," he said. "We have to be very realistic and honest to ourselves and our fans and say we have a long journey." Makes sense to me. Gil was probably going to run the IndyCar team, so that's no longer an option. So was Alonso part of the effort or not? Hmmm, oh well. McLaren need to concentrate on F1 and not stretch its resources any further. 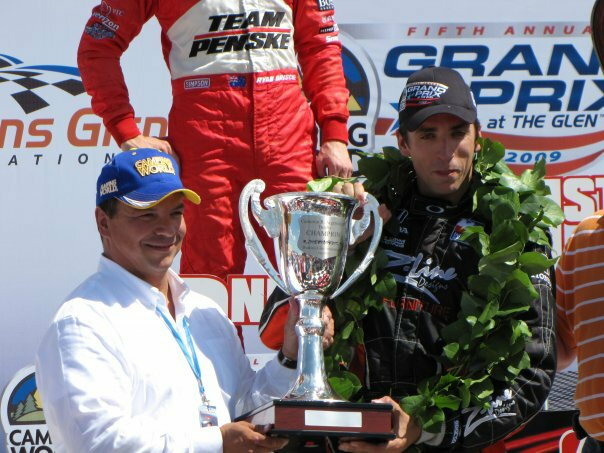 My brother handing Justin Wilson of Dale Coyne racing, the winning trophy at the "Camping World Grand Prix at the Glen" July 7th, 2009. It was Coyne's first race win out of 558 tries. Fernando Alonso is expected to test a Honda-powered Andretti Autosport Dallara DW12 early next month to gauge his interest in the 2018 IndyCar package on a road course. RACER has learned via multiple sources that a number of road course test dates have been held for Alonso this year, and despite going unused, an outing in the days following the September 2 Portland Grand Prix is likely to go forward with the two-time Formula 1 world champion. Barber Motorsports Park has been suggested as the venue for Alonso’s outing, which would conform to recent guidelines IndyCar has established for Alonso to test somewhere other than the remaining tracks left on the championship calendar in an effort to prevent any data he might provide from being used to the team’s benefit as Andretti’s Alexander Rossi vies for the title. Alonso’s first introduction to the Verizon IndyCar Series came in 2017 at the Leeds, Alabama circuit, when he took part in a press conference and spoke with NBCSN’s Townsend Bell ahead of his Indy 500 debut with the Andretti-McLaren-Honda team. The Spaniard was instantly competitive in the No. 29 Honda at the Indianapolis Motor Speedway, and with this week’s news of his upcoming retirement from Formula 1, sampling an IndyCar for the first time on a road course with the new-for-2018 low-downforce universal aero kit would appear to be the final step in determining whether IndyCar will become his new home. As RACER has written more than once since the Mid-Ohio IndyCar round, Andretti Autosport and Harding Racing have been exploring a union that would allow Andretti to expand its four-car program to accommodate everything from an ‘Andretti Junior Team’ to field up-and-coming drivers, to housing an Andretti-McLaren effort in a dedicated facility of its own. Mounting rumors this week have positioned the Wink Hartman-owned Harding Racing shop that stands within view of the Indianapolis Motor Speedway as becoming the Andretti-McLaren base of operations in North America. Another key factor that continues to surface is the unlikely scenario of an Andretti-McLaren effort being powered by Honda. Despite the upcoming test for Alonso in an Andretti-Honda DW12, using Chevrolet power on a full-time basis, from a separate shop, is said to be the workaround that would allow Andretti Autosport to maintain peace with Honda while starting a new venture with McLaren and Chevy. I don't understand what the issue is with McLaren using a Honda engine in IndyCar. ^ my guess is Honda exec's and HRC were very displeased at Alonso's comments about Honda's F1 PU over the years. Yet they had no problems with him at Indy in 2017. Maybe the bigger issue is that Alonso is driving a Toyota in WEC. Driving both a Toyota and a Honda at the same time might be too much. ^ Alonso was racing for Honda in 2017 with F1 and Indy, his media and radio comments about Honda woes (unreliable and power) got worst as the year went on. Honda were very unhappy from some of his comments. Hoping Alonso does his Indycar road test at the Glen. 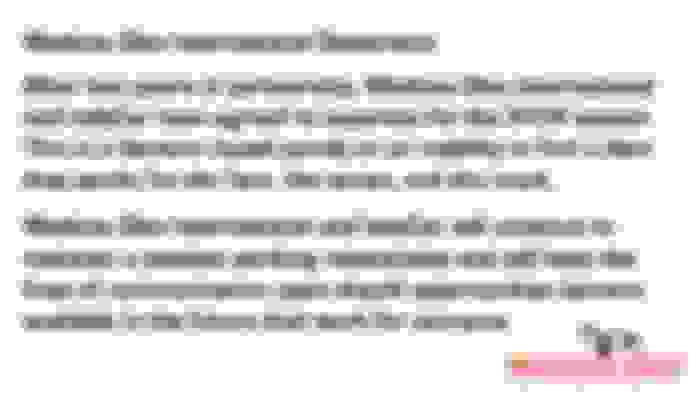 According to this report. American Honda would love to have Alonso and McLaren use their engines in 2019. The problem is that Honda Motor Company (jp) hates McLaren, not Alonso. Really horrific crash at the Poconos yesterday. Speedy recovery to Wickens, that video is hard to watch. Would be a real shame if he left F1 and is not able to secure a full time Indy car ride. I still really want to see him in F1 in a competitive car one last time. IndyCar has reached a new multi-year agreement to continue racing at Texas Motor Speedway, despite the series being in talks with the Circuit of The Americas. TMS president Eddie Gossage had a non-compete ‘radius clause’ in the last contract with the series, whereby no IndyCar race could be held within a certain radius of the oval outside Fort Worth, TX. That effectively ruled out COTA, which lies approximately 220 miles south, near Austin, TX. However, despite IndyCar being now deep in talks with COTA for the 20-turn 3.4-mile course to replace Phoenix’s ISM Raceway in IndyCar’s late-March/early-April slot, Gossage has apparently compromised from his previous stance, and renewed TMS’s deal. Gossage had also been hoping to snag the immediate post-Indy 500 weekend for TMS’s IndyCar round, a schedule slot currently occupied by the double-header Dual in Detroit, on Belle Isle. However, that Penske-run event has overcome local opposition and will return to the 2019 schedule in its traditional date. It is understood, therefore, that IndyCar will race at TMS again in June. With Laguna Seca announced last month as replacement for Sonoma, and TMS’s renewal (to be announced on Tuesday), sealing a deal with COTA appear to be the last hurdle to overcome before IndyCar announces a 17-race calendar. A decision is expected within the next 10 days. Although IndyCar is still in discussions over a return to Richmond International Raceway, that is now more likely to occur in 2020. I saw that, unbelievable and a testament to the safety features of Indycar. Thankfully he walked away. Last edited by Chief F1 Fan; 08-20-2018 at 11:19 AM.